Apparently Senator Barack Obama was a bit cheeky when he altered a presidential seal during his campaign. The seal would usually have an eagle clutching arrows and an olive branch above the words ‘E pluribus unum’ – meaning ‘out of many one’.The Obama camp altered the words to read ‘Vero Possumus’, loosely translated as ‘yes, we can’. It may have raised eyebrows on the campaign trail, but we think it’s great! Sure the Possum reference is a little oblique, but the sentiment resonates with Possum New Zealand and the work we do. You can read the full post from Reuters here. The Emporio Armani Fall Collection at Milan Fashion Week featured a number of fur collars and accessories. However, our favourite was the Leopard-print handbag. 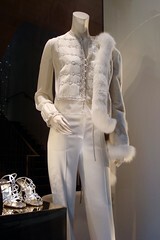 Very chic! Have a look at some of the photos here or check out the runway video. We noticed a few Fox collars similar to our Possum fur Audrey Hepburn, and a jacket trimmed with a collar similar to our fur Shawl Collar. Faux Fur. What’s the Real Cost? There are all sorts of issues surrounding fur and we realise that it’s not for everybody. One of the main proposed alternatives to real fur is faux-fur. But it’s worth remembering in this age of environmental awareness that there are two sides to every coin. Many consumers purchase faux-fur thinking that they’re getting the best of both worlds: a stylish warm product and a nice warm-fuzzy for Mother Nature. Sadly the opposite is true. Most faux fur is made from polyester, nylon or a synthetic polymer of Nitrile – the same stuff used in industrial PVC and rubber. Take a swing by your friendly neighbourhood rubbish dump and you’ll see ample evidence of what your faux-fur coat could be made out of! Products like this make a major environmental impact. They require lots of chemicals in their production, and one of the many by-products of this is greenhouse gas. Unfortunately, once you’ve finished with it, the problem just gets worse. Synthetic products are non-biodegradable, so they clog up landfills for years after they’ve been disposed of. Synthetic products have negative environmental ramifications, both in making them and disposing of them. Which brings us to fur. And more specifically in the context of this blog, Possum fur. Many people look at the ‘eco-fur’ label and say “well, that’s just clever marketing; it’s still the fur trade.” But is it? In New Zealand the environmental impact of the Brushtail Possum is well known. But don’t take our word for it. This is the National Geographic’s take on it. The New Zealand Department of Conservation themselves acknowledge that there is no one solution, and their current 1080 poison creates other problems. That’s why the ‘eco-fur’ tag is appropriate for Possum. Every animal taken out of our eco-system helps a little with the delicate balance. Lots of small actions add up to a greater whole. The numbers speak for themselves. 70,000,000 possums eating 8,000,000 tons of New Zealand native bush every year. Eeep! That’s why we believe that a commercially driven strategy, hand-in-hand with an eradication program will have the best long term results. So how do you differentiate the PR spin from the real story? One word: Awareness. We’re not going to tell you what to wear. That’s your personal decision. What we do say is: dig a little deeper. Do some research. Check out the manufacturer’s claims. Just because something is labelled ‘green’ it doesn’t necessarily do the planet a favour. From today’s New Zealand Herald, came this story out of Australia, about research into non-lethal Possum deterrents. Apparently Dingo wee is the way to go! Any alternative to poisoning is fantastic, but at $20 for 40ml, it’s pretty steep. A Possum fur scarf is positively cheap by comparison. You can read the full article here (all ‘wee problem’ puns included). Have you got a possum fur-trimmed eco-bag? Made from recycled plastic, they’re hard-wearing, bright and incredibly popular! And, this month we’re giving them away. Sign up for our monthly newsletter, and for every NEW registration we’ll pop an eco-bag in the post for you! Not only will you be kept up-to-date with all our latest news and specials, you’ll look super-stylish at the supermarket or library. Plus, you’ll be in the draw for our monthly prize: the Possum fur Audrey Hepburn collar. Whew, that’s a lot of winning in June. Don’t miss out! The offer ends on 30 June so click here to join our mailing list. We’ve launched our shorn Possum fur decor range. We’ve got a shorn Mini Throw and our New Medium throw, plus a shorn Cushion and Pillow! 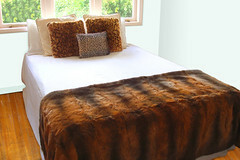 The mini throw is one of our most popular products, and the Shorn Possum fur has a really unique texture, so we’re expecting them to be really popular. Have a look at the range by clicking here. This month we’re running our Possum-2-Go promo. If you buy any Possum Merino knitwear garment*, we’ll throw in a complimentary Possum fur scarf, a matching eco-bag and FREE shipping! That’s over $100 of extra stuff – for free! Plus, if you buy our knitwear online, it’s ALL at wholesale prices (but don’t tell our wholesalers…). Click here to see the Possum-2-Go combo or view all our Possum Merino knitwear. Prices from NZ$200. *Excludes Possum Merino T-Cosy Hat. It would be nice to see more of a unified effort regarding Possum fur, as a commercial approach is going to provide New Zealand with the most benefit, long-term. It’s interesting to note that 1080 poisoning costs $80 million every year! We’ll keep an eye on how this develops and let you know. If you’re interested you can have a look at the original press release at scoop.co.nz. Possum or Opossum? Do you know? Every month we get some queries regarding the differences between the North American Opossum and our very own Brushtail Possum. Well, that and a request for a Possum pie recipe (but that’s a whole other blog entry). Other than the spelling, there are lots of differences, and we decided to put some of the myths and misconceptions to bed once and for all. In the process we discovered some interesting facts. Did you know that the American Opossum was introduced to North America as a food source during the Great Depression? So, there you go! Makes for good dinner party conversation, huh? Oh, and if you want to see photos, you’ll need this link. Congratulations to Krystle Solomon of Auckland, New Zealand. Krystle won our Possum fur cellphone holder worth NZ$45.00!